We need to talk about Girls on the Run. I first heard about it awhile back when one of my friends from college posted some adorable gifts she’d made for her team and I was very curious. I loved running and growing up I had always done a lot of volunteer work with younger kids and mentored, but found I didn’t have time to keep up with it in college. I missed it. So, when I started reading more about GOTR, I knew I wanted to get involved. Girls on the Run is a non-profit organization that has volunteers from the area meet a couple of times a week to coach 3rd-5th graders about running and building positive body image. Each lesson has a focus on a topic that resonates with their age group. This weeks topic for instance was bullying. We’ve also discussed plugging in to positivity, taking a second to stop and breathe, gossiping, and a whole lotta other fun things. We always start out with a snack and an overview discussion about what we’re covering that day and then head outside for a game that gets the girls moving but also incorporates the topic. After that, it’s running until their parents come and steal them back. Each week has been better than the last and I’m loving being a coach. The girls are always so enthusiastic about learning the new lesson and it’s not hard to get them to participate in discussions at all. Plus, by far the most interesting part is that girls this age have no filter. They will tell you what’s on their mind whether or not you want to hear it and they say some of the best little tidbits. For instance, this past week when we were discussing bullying, we had the girls run laps and when they would finish a lap we would ask them a question like “If you saw a third grader bullying a first grader, what would you do?” and they have to think about the answer while they take the next lap and then report back with an answer. The girls got so in to this exercise, they were running their laps at warp speed I swear. I couldn’t blink before they were back again ready and eager for a new question. Even after we were finished and were waiting for carpools to pull up, the girls were still asking for questions and it was awesome. I also made a quick fun treat for them post-run. It took me all of 5 minutes, but they loved it. To write the messages, you just take a clean safety pin and lightly etch in the words. Wait a couple of minutes and they’ll get darker as they oxidize. 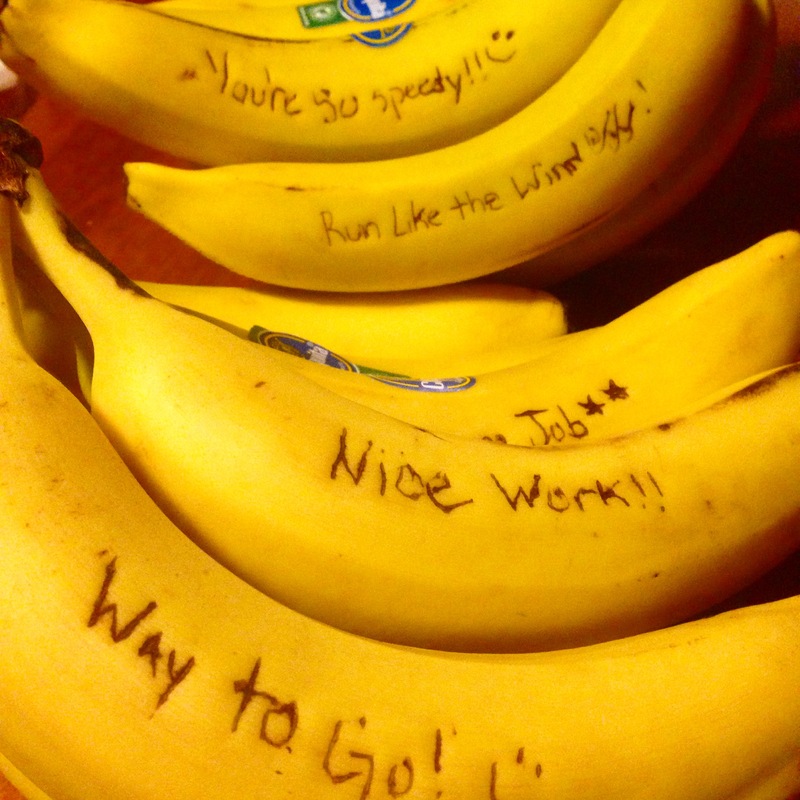 When I told the girls they were getting bananas after their run, you would have thought I told them it was birthday cake. I honestly have never seen any one get so excited over fruit, but I guess this group is a rare breed. The season is wrapping up in a couple of weeks and I have learned so much from being a coach and from these girls. I can’t wait for the spring season. Check out Girls on the Run and see if they have one in your area. Even if you can’t volunteer every week, try to run the 5k at the end of the season! I’m sure it’ll mean a lot to the girls just to have more friendly fitfam members by their side. getting out of that comfort zone. I recently joined a local choir. I have been a singer for a pretty hefty portion of my life, even majoring in vocal performance in college, but as soon as I graduated, I needed to get away from it. After taking two years off from singing in pretty much any capacity, I was itching to get back into it. But I knew I didn’t want to go in as intensely as I had before. So, I went back to my roots. I joined a local church choir that meets only a couple of blocks from my house. I am by far and away the youngest person there by a good thirty or forty years. When I first set out to join, I was nervous. I hadn’t sung in awhile and I wasn’t sure if I would like singing in that setting, but I couldn’t be happier that I joined. As I was sitting listening to those around me, I couldn’t help thinking about how this paralleled so perfectly with starting a workout regimen. We all start at different levels. Some have a natural talent for running at the drop or a hat or just being able to lift heavier than the person next to them, but to get better, they have to train. You can’t expect to get fit by just wishing it. You can’t expect to be a good singer if you never sing. Everyone starts somewhere. Even if you are the worst singer in the world, as long as you dive in and try, who cares. The same can be said for working out. Maybe you can’t even run one mile. If you start working for it, eventually you will get there. You just have to break past that comfort zone and just try it. Just start. You could be the worst singer, runner, pretty much anything in the world, but as long as you’re trying at it, it doesn’t matter. 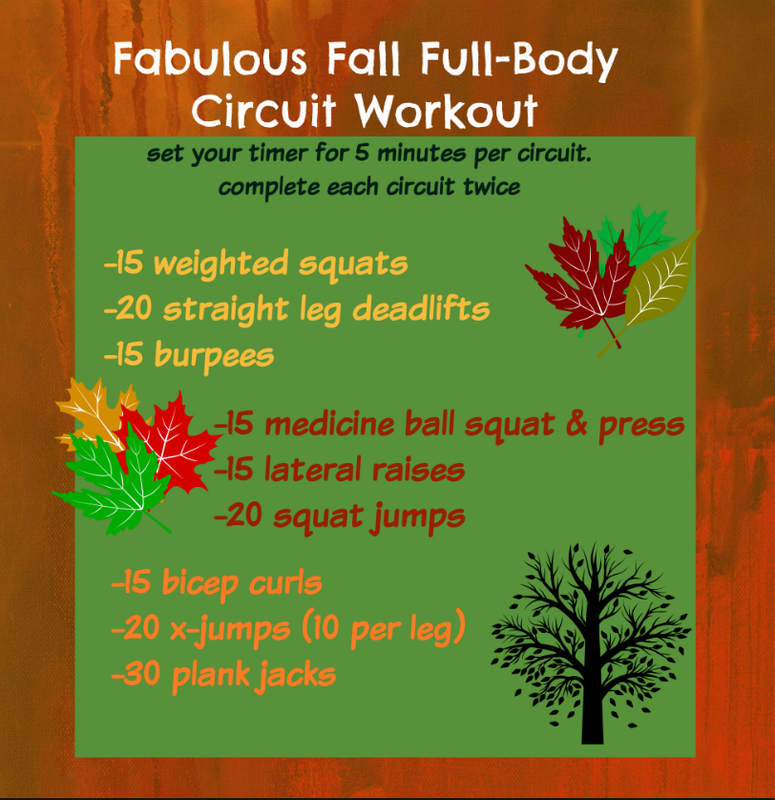 Here’s a little fall full-body workout for you to try that you can either do one time through for a quick 15 minute workout or twice through for a bigger challenge. Either way, it’s a great one whether today is your first day hitting the gym or not. As long as you’re getting out there and pushing yourself out of that comfort zone, you should be proud. And at the end of the day, that’s all that counts.